Groom Away Anti-Fungal Hoof Oil is a completely natural anti fungal and anti bacterial hoof oil which helps to nourish, lubricate and protect the maintenance of healthy feet. After application it can be buffed to provide a glossy show ring finish. It is infused with natural extracts which ensure it is the ideal product for use on weak and brittle hooves, splits and sand cracks. During the wetter months it also acts as a barrier against fungal and bacterial issues which helps prevent smelly frogs. 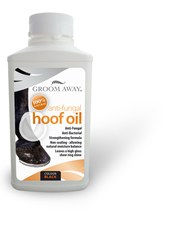 There are currently no questions for Groom Away Anti-Fungal Hoof Oil for Horses - be the first to ask one!